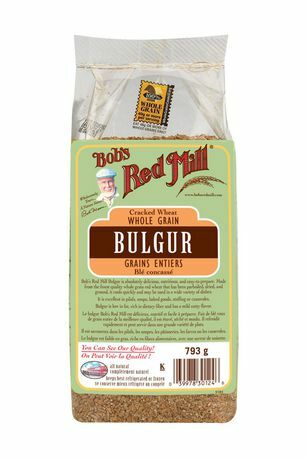 Bulgur wheat is a whole grain made by boiling groats (wheat berries) until they crack open; it can be made of different wheat species, but it’s typically durum wheat. Because the grain has been cracked and partially pre-cooked, the cooking time in our kitchens is decreased – making it very convenient and simple to prepare. Yet because the bran/germ/endosperm of the wheat kernel remain intact, bulgur is naturally high in fiber, low in fat and low in calories. It’s also a good source of protein, iron, and vitamin B-6. * To save time, you can purchase a bag of cut up broccoli, cauliflower and carrots in the produce section. Also, I pulse the zucchini, peppers and cucumber separately, or I chop them by hand. Because of their water content, they can get too mushy in the food processor). 1/2 cup bulgar wheat: Bring 1/2 cup water to boil, add bulgur and let sit for 20 minutes. Add to salad. Mix in the below dressing. You can add or delete any combination of veggies to this recipe – it’s very versatile! the ground before it can grow and produce much more wheat. If it never dies, it will never be more than a single seed. In the above verse, Jesus was comparing his approaching death to the paradox that a grain of wheat must die (be buried) in order to produce a great harvest of more wheat. Jesus’s death and burial allowed for the great harvest of believer’s souls. His sacrifice was the payment needed to cover our sin and put us in right standing with God – something we can never do on our own. I am so glad I signed up for your blog too Cyd. 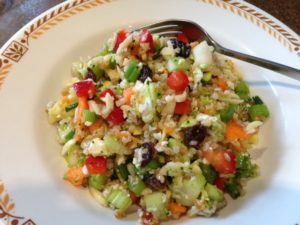 If I hadn’t’ I may never had been introduced to Bulgur wheat. Thanks, Jim, I know you’ll enjoy it!